OK, not only is it the morning after the World Series, but it is also Halloween. You don’t really feel like working today, do you? Besides, you may be stuck by your front door for hours, waiting to dole out treats to a stream of ghosts and goblins. WordStar was the most popular word processor. If you’re in the mood for a bit of retro fun, try out the Internet Archive’s new Historical Software Collection. 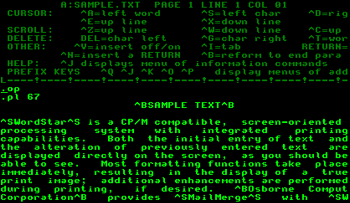 Right in your browser, you can run a working version of WordStar, the most popular word-processing program of the early 1980s, or fire up a 1979 version of VisiCalc, the first-ever spreadsheet program, which was designed for the Apple II. If games are more your thing, the collection includes classic adventure games such as The Hobbit, a 1982 game for then-popular home computers such as the Commodore 64, and Akalabeth: World of Doom, a 1980 role-playing game for the Apple II; chess games such as Chess by Peter Jennings, considered one of the first commercial game programs ever, and the Sargon Chess program, first released in 1978 at a price of $895; and multiple versions of Pac-Man. Some of these programs are fully operational, others appear to run only in a demo mode. If nothing else, they are a reminder of from whence we came.